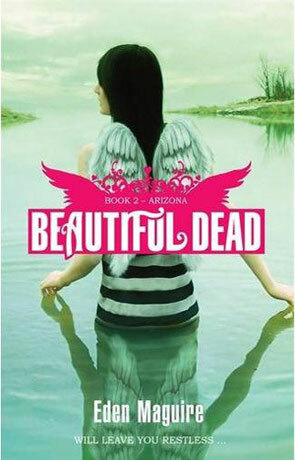 Beautiful Dead: Arizona is the second volume in the Beautiful Dead series of novels by Eden Maguire. Following on from the events in "Jonas", Darina has seen no sign of the Beautiful Dead for weeks and is missing Phoenix all over again. With so much still to resolve, surely they will return soon? Arizona drowned in Harman Lake 10 months ago, her cause of death recorded as suicide, which doesn't make sense, Ellerton High School's drama queen and a strong and confident girl, would Arizona really kill herself in a secluded lake? So Darina must help Arizona the way she helped Jonas and let her rest in peace. With invisible wings beating again and time running out, the Beautiful dead detective faces her toughest challenge yet. Arizona is a great book, written for young adults, it is both entertaining, fun to read and yet deals with some very big issues. Like it's predecessor, Arizona manages to portray death and the loss of a loved one with compassion and intelligence while not unbalancing the story. While I don't always like to compare, fans of Twilight will love this series which a smooth blend of horror, modern culture and crime genres and Beautiful Dead Arizona manages to make the rare distinction of a book you cannot put down. I await volume 3 (Summer) with baited breath.